Our association with bees is often one of disdain, those buzzing creatures that sting us and hover around our pints in the sun. However, without bees our flowers would not pollinate, and unwillingly, the human race would die out. Yeah, so bees are quite important, and so is Pollen Party, a fresh 5 reel slot game based around that very concept, pollination. Spin your way through a honeycomb gameboard filled with cute worker bees and queens to earn some free spins and bonuses today. The developer team at Microgaming is very creative and always stays up to date with the market providing products with the highest quality standards to their audience. The company was founded little over 20 years ago and delivers entertaining and innovative games. They developed more than 850 unique casino games so far, including 1,200 variants. Microgaming offers monthly releases of new games to keep their audience entertained with exciting themes and unique gameplay experiences. Be invited into the life of a bee colony and watch them while they work very hard to gather all the pollen and produce tasty honey. The reels take an interesting and uncommon shape of a honeycomb adding a lot to the game feel. In the background you can see a hilly landscape ,under a beautiful blue sky, filled with beehives. In this game you can form winning combinations by matching symbols in adjacent rows starting from the left. On the five reels a various rows you can find a busy medical bee, an armed warrior bee, a hardworking worker bee, the gorgeous queen bee, some nice jelly, some tasty honey, a honeycomb and a nice bowl of sugar. The Pollen Party logo is the wild in this game and will replace any other symbol, except for the scatter and bonus symbol, to form winning combinations. Look out for a punky bee, it is the scatter of the game and if you land three or more of them in the same spin you activate the free spins feature. You are awarded 12 free spins and if you manage to land a flower symbol on reel three during this feature it will add another three extra wilds to the reel. As the flower symbol will also work as a wild it increases the chances of winning combinations massively. If you find three or more baby bee bonus symbols in one spin you are lucky. You will be taken to a different mini game where you are presented with a honeycomb. All you have to do is to keep picking for cash prizes in the honeycomb. If you find a “pop” location however the game ends and you are taken back to the base game. If you found an extra life before the “pop” location you will extend the round for a little longer. This video slot offers an impressive amount of 720 paylines. To watch the bees work you have to place a minimum bet of 50p or, if you consider yourself somewhat of a high roller, up to 250 pounds. Pollen Party has a great game feel with lots and lots of theme related symbols on the unique reel set. There are exciting bonus features such as the free spins or the Babee Bonus game that will increase the chances of turning your spin very lucrative. The aesthetics will emerge you into this entertaining game. 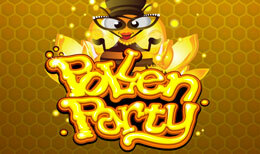 Pollen party provides a great gameplay experience and is a nice variation to common online slot themes.